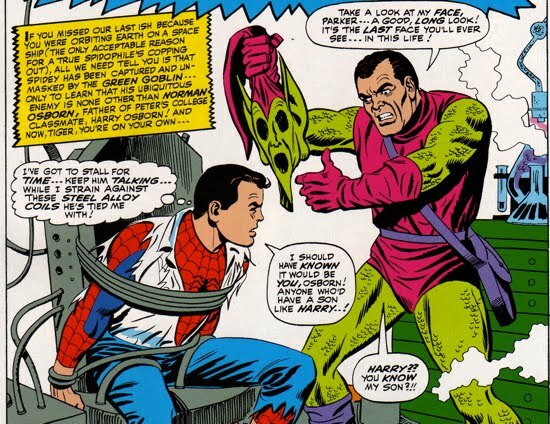 Although Norman Osborn had just recently tangled with Spidey in Amazing Spider-Man #38, his Green Goblin persona had been on hiatus for some time. But the Goblin did not plan on staying in the shadows forever, and in Amazing Spider-Man #39 the Green Goblin makes his return. While suiting up in his Goblin attire, Norman decides that he has "waited long enough" and that the time to destroy his greatest enemy has arrived. And this time the Green Goblin has a new kind of plan in store for the web slinger. He is not going to destroy him, because that would not give the Goblin enough satisfaction. Instead he wants to humiliate Spider-Man by learning his secret identity and revealing it publicly. After he announces Spider-Man's identity to the public, he will then kill him. The Green Goblin has certainly been awaiting this moment since he passed up the opportunity to unmask him in Amazing Spider-Man #26. In order to unmask Spider-Man though, the Goblin knows he must first deactivate his Spider-Sense. So the Goblin stages a “trumped up” robbery to bait Spider-Man. The plan is successful, and during the fight with the robbers, Spider-Man is exposed to a gas that was designed by the Goblin to dull Spider-Sense. With a compromised Spider-Sense, Peter is completely unaware that he his being tailed by the Goblin. When he first sees Spider-Man without his mask, the Goblin is surprised to see that he is just a kid, and he guestimates that he can't be older than nineteen or twenty years old. The Green Goblin is then able to listen in on Peter's conversations with a shotgun mike, uncovering Spider-Man's identity as the young man Peter Parker. After following him home, the Goblin then confronts Spider-Man on his front lawn. The Green Goblin calls out Peter's name and begins taunting him as well, referring to him as "little man". Peter is completely baffled as to how the Goblin was able to figure it out his secret identity and he panics as he struggles to steer the fight away from Aunt May. The Goblin attacks Spider-Man using everything in his arsenal from flying bat missiles to smoke screens. Peter is outmatched and the Goblin takes him captive. Back at his waterfront hideout, the arrogant Green Goblin exposes his true identity as Norman Osborn, and Peter immediately recognizes him as Harry's father. The Goblin feels comfortable allowing Peter to learn his identity since he is convinced Peter is not making it out of hideout alive. Amazing Spider-Man #40 picks up immediately following the events of the prior issue, with Peter Parker being held captive by the Green Goblin. The Goblin then proceeds to tell Spider-Man the story of how he became the masked villain, a thorough synopsis of this story can be found here. Peter baits Norman into rambling on about his past in an effort to buy time as he struggles to free himself the chains. 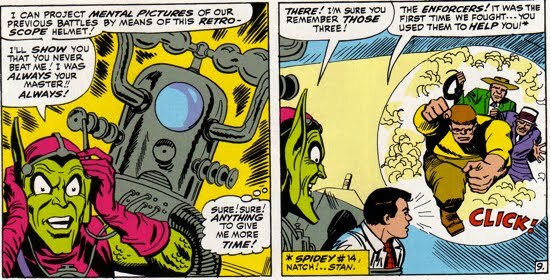 But before Peter can get free, the Goblin recounts their prior battles using a "retro-scope helmet." During this relatively quirky scene, Norman tries to convince Peter that Spider-Man has never defeated the Goblin. 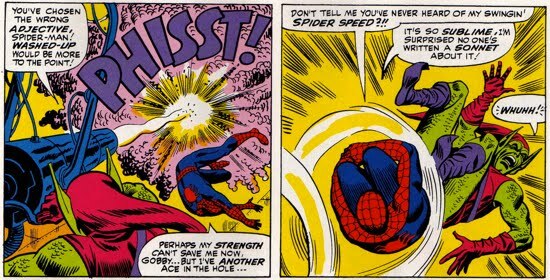 He then frees Spider-Man to allow him to fight, because killing him while he is restrained would be a "hollow victory". The two trade blows in a confrontation in which each of them hold their own. Spider-Man eventually destroys the Goblin Glider and after a solid kick from Spidey the Goblin loses his footing and he knocks live electrical wires into a pool of chemicals. 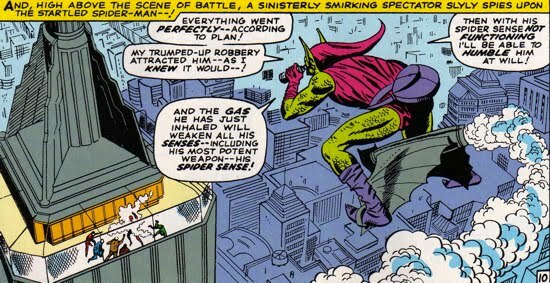 As the Green Goblin falls into the chemicals, the resulting "electro-chemical charge" blasts him rendering the Goblin unconscious. The exposure to the electricity and chemicals gives Norman temporary amnesia, causing him to forget the “last few years” and thus ever becoming the Green Goblin. Spider-Man changes Norman back into his civilian clothes and hands him over to some firemen who are there to put out the burning building. Spidey tells the firemen that Norman helped him to "finish off" the Goblin in an effort to keep Norman's escapades as the Goblin secret. Between the fire and Spidey's cover up, the authorities believe the Green Goblin to be dead. Norman is sent to the hospital where he sees his son Harry. Norman tells Harry that the past few years have been "forever lost to him" but that their future will be better. It should also be noted that in the retconned story Spider-Man: Blue #1, Peter goes and visits Norman and Harry in the hospital to confirm that Norman does not remember Peter is Spider-Man. Norman's mentioning of his "lost" past few years coincides with Harry's statement that his father "started to change" a few years ago. This timeline is examine further here.